Cara Black will appear at the Velma Teague Library today to discuss her latest Aimée Leduc mystery, Murder in the Latin Quarter. Each of Black's books deal with a particular section of the city of Paris. This complex story takes readers to the Latin Quarter on the Left Bank of the Seine, in the old university district of Paris. It takes us back to 1997, in the weeks following Princess Diana's death, when the police, and the world, were caught up in that story. Aimée Leduc and her business partner, René, are building their company, Leduc Detective. However, Aimée is a lonely figure. She lost her father and her fiance, and her mother disappeared years earlier. So, she's susceptible when an illegal Haitian immigrant named Mireille shows up in the office, claiming to be her half-sister. She desperately wants to believe her, but when Mireille sets up a meeting place, Aimée stumbles over a murdered body. Aimée flees from the scene when the police arrive, but soon finds herself running from other unknown figures. René tries to convince her that Mireille set her up, and isn't actually her sister. Despite René's insistence that she needs to concentrate on their work, "A supposed half-sister entering her life and then disappearing, followed by a murder made it hard to focus." But, when Mireille shows up at Leduc's apartment, Aimée doesn't have enough time to probe the story before the police show up, and Mireille escapes. Aimée's need for answers sends her into the convoluted world of Haitian politics, history and religion. There's also a story of illegal immigration, and people seeking asylum. Black builds the suspense in a story of an unfamiliar culture, and the consequences of past actions. Aimée Leduc's life will never be the same after an investigation that becomes much larger than whether or not has a sister. 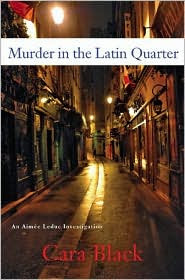 Murder in the Latin Quarter by Cara Black. Soho Press, Incorporated, ©2009. ISBN 9781569475416 (hardcover), 304p. I was in Paris in '84. I like reading books about places I've been. This is a series that I am going to start reading. I have the first book here. However, because it is a vast compulsion in my life to read mystery series' in order, I'll get to this one after a while. Thanks for the review and I hope your event goes well. You should enjoy the books, Mel, if you've been to Paris. I totally understand, Kay. I have a hard time when I can't start the series from the beginning.